The Welsh Raider sees the Cycling Weekly sportive series enter new territory, with the longer two routes crossing the border from England into Wales. Why ride it? The Cycling Weekly Welsh Raider gives you the opportunity to ride in two countries in a single day, and you can leave your passport at home. Not only is the area steeped in history, the undulating terrain also offers a great late season workout. 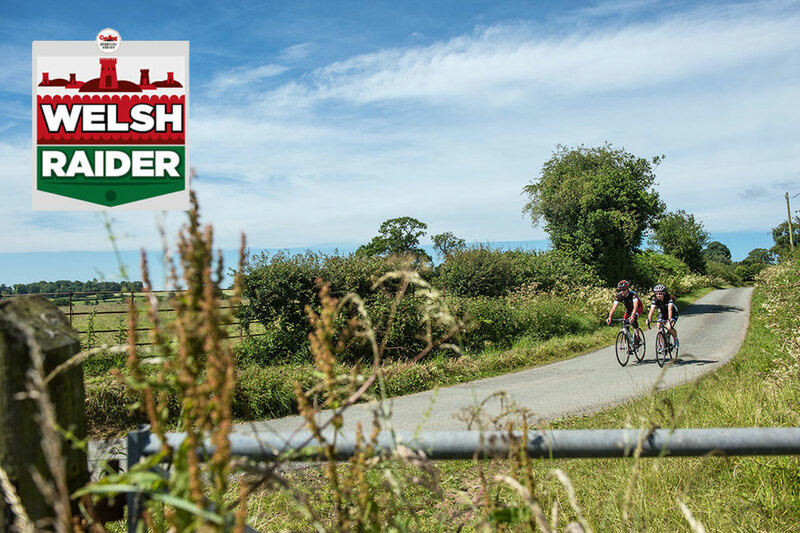 The Welsh Raider brings an international feel to the Cycling Weekly Sportive Series, with two of the three routes crossing the border between England and Wales. If you’ve signed up for the short route you will remain firmly in England for the duration of the 45 miles, with a hilly ride around Shropshire. All three routes depart Ludlow Racecourse to the north, before the Short and Epic riders take a right to head inland to the first of the route’s two real climbs. Coming just four miles into the route, Hope Climb is a nice round one-mile ascent at an average of eight per cent up to 775ft, with one short section hitting 15 per cent. The descent will come as a welcome relief, but it’s not long until you’re heading uphill again. Once you hit the bottom you start the five-mile shallow ascent through Cleedownton. The tough ascent is softened by the lengthy run back down through Burwarton. A four-mile descent will give you the chance to feel the wind rush through your helmet vents safe in the knowledge that you won’t be met by another steep hill at the bottom. The good news for those riding the Short route is that there aren’t really any more long climbs left, with the route back towards Ludlow packed with shallow ups and downs. At the 40-mile mark the Short riders head south back to Ludlow and their hard-earned cup of tea. But there’s no rest for those on the Epic course, who continue straight towards the Wales border. This is where the Epic riders join those on the Standard route, with a relatively straightforward 30 miles until you reach Abermule. Here’s where the big challenge comes, with the ascent to Ceri car park. The climb is not for the feint of heart, especially 75 miles into a ride. At over three miles long, the climb averages five per cent, with a ramp three-quarters of the way up pushing into double figures. Good news! At the top of the Ceri climb it’s virtually downhill all the way back to Ludlow, starting with a swift 25-mile descent back across border into England. Once back near Ludlow, the route heads back south at Seifton and you’re in the home straight. Get yourself across the finish line in one piece and make the most of the refreshments, bike wash and massage available at the racecourse. 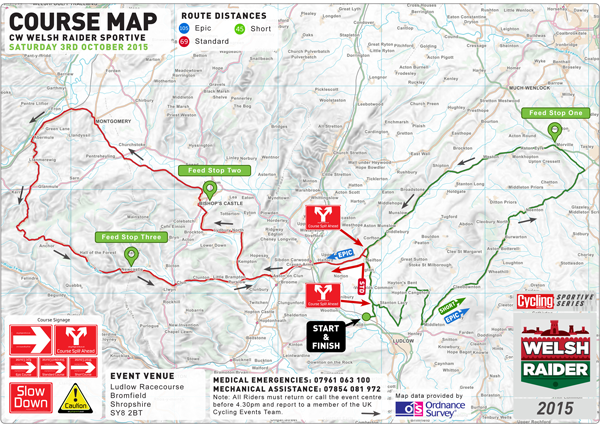 Three routes, plenty of hills for the grimpeurs among you, with a lot of downhill sections for the daredevil descenders in the pack. The Ceri climb is the highest point on the course, meaning it’s some descent down the other side. Make use of this bit of respite so close to the end of the ride to recover the energy to sprint at the finish. The Welsh hills are where you’ll likely feel the burn the most in this challenging sportive, with the Ceri climb the toughest of the lot. At around four kilometers and an average of seven per cent, the climb will test your tired legs to the max. But remember, once you get to the top it’s downhill almost all the way back to Ludlow. Where to stay: Fishmore Hall in Ludlow offers a little bit of luxury the night before your big ride and is just three miles from the start line. A standard room at the 15-bedroom hotel is available from £75 per night. Local Bike Shop: Epic Cycles on Weeping Cross Lane in Ludlow will be able to fix you up for accessories and components ahead of the Welsh Raider and is just a three mile drive from the racecourse.